way of the cytotoxic function of these agents. Based on complementation studies, the same group also reported evidence for a direct involvement of the FANCC protein in the repair of oxidatively damaged DNA (129). Using a classic shuttle vector system, Liebetrau and coworkers (130) reported increased rates and specific types of mutations in the plasmid pZ189 that was passaged through FA cells at 20 versus 5% (v/v) oxygen conditions. Most recently, Kelley and colleagues (131) showed that the Drosophila S3 multifunctional DNA repair/ribosomal protein protects FANCC cells against oxidative DNA-damaging agents. On the cyto-genetic and cell cycle levels, DL-a-tocopherol (as a potent lipophilic antioxidant) has been reported to decrease the frequency of chromosomal damage and the duration of the G2 phase in 72-hr cultures of primary FA lymphocytes (132). It is obvious from these studies that the oxidative stress theory provides an attractive explanation for a variety of phenotypic features and cellular behaviors that are commonly encountered in patients with FA. These features include the early and frequent occurrence of MDS (133), bone marrow failure, pigmentary chances, and the emergence of squamous cell carcinomas at locations of typically high oxygen exposure (126,128). 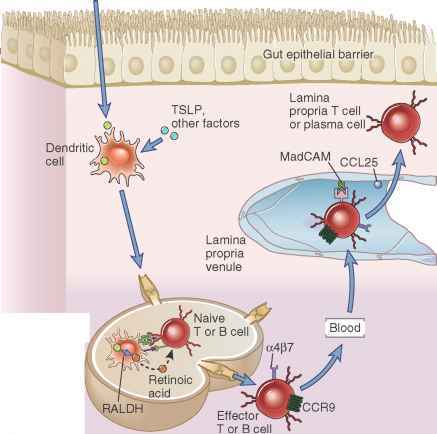 The strongly elevated cancer risk persists after successful bone marrow transplantation (see Fig. 7). Figure 7 Time course of successful bone marrow transplantation (BMT) of an 8-year-old FA patient monitored by analysis of G2 phase accumulations in 72-h peripheral blood mononuclear cultures. The patient's blood was analyzed on two occasions prior to BMT on May 1, 1992, each time showing a sum of G2/GF values typical for other FA patients (straight squares). 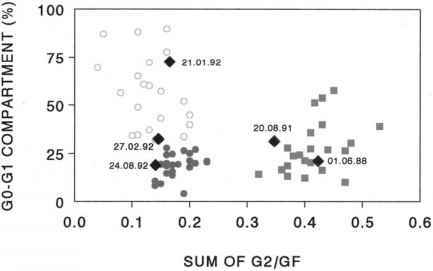 There was no evidence for G2 phase accumulations at 2 weeks after transplant, but the fraction of noncycling (G0-G1) cells was as high as usually seen in patients with non-Fanconi aplastic anemia (outlined circles). One month later, mitogen response was much improved, as indicated by the lower G0-G1 value, and at 8 months after transplant, the patient's cells could not no longer be differentiated from control cells (solid circles) indicating complete repopulation of his bone marrow by donor cells. The patient died 8 years after transplant from carcinoma of the tongue. hypothetical involvement of FA proteins in the oxidative stress response. In these studies, neither oxygen tension of the cell culture environment nor clastogens and oxidative stress were found to influence the expression of the FANCC gene that appears to be constitutively expressed at rather stable levels throughout the cell cycle.